A big part of the Tesla mythos is that you’re always being promised a brighter future. When so much of it comes through, you forget about the stuff that doesn’t, like battery-swap stations or full self-driving or highways lined with... well, these things. And now, here’s a full list of everything Tesla is telling us it wants to do this year. It’s a lot. Tesla just put out its 2018 roundup letter to investors and included two new things in it: Tesla Model 3 production should go up and stay up at 7,000 cars per week. This was another expanded item from the investor letter. “Additionally, this year we will start tooling for Model Y to achieve volume production by the end of 2020, most likely at Gigafactory 1.” The Y is another crossover, but compact, and looking like an X but with more swoops. As you’re no doubt aware, the small crossover market is white-hot right now, and while the Model 3 often feels like the only send people are buying en masse the Model Y is poised to do even better. Musk had previously told shareholders that he would have a site for the Y picked out either in the third quarter of last year (didn’t happen) or by the end of the fourth quarter of last year (still hasn’t exactly happened). Musk declared that very low production would begin earlier in 2020. Muskbroke ground on Tesla’s foothold in China this year, in Shanghai specifically. This is the third of Tesla’s Gigafactories, and is supposedly getting $7 billion funneled into it, as we reported from Musk’s Twitter and XinhuaNet.com. Being that China is the world’s largest car market and the linchpin of the EV sector, this factory is extremely critical. The factory will be making only base-model Model 3s at first, but Tesla also said that it’ll make the Model Y there in 2020. Tesla said it wants production to begin by the end of this year and for full production to be underway by next year. That’d be 500,000 cars, as we previously noted. 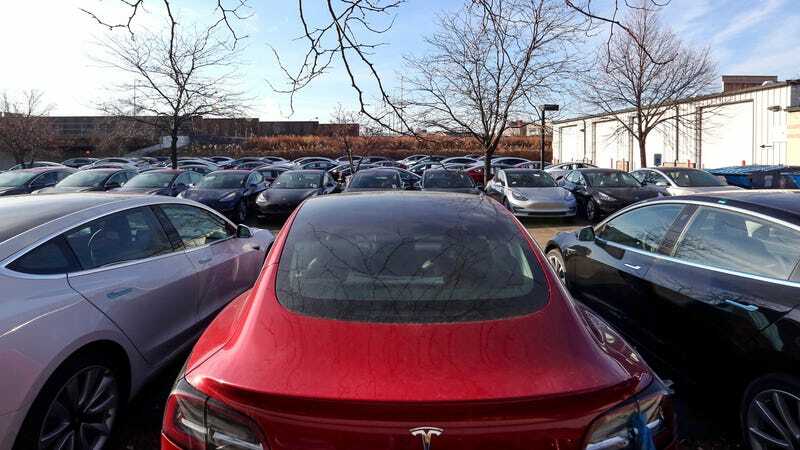 The Model 3 finally got through a handful of regulatory hurdles and is approved for sale in the EU, as we reported from Bloomberg earlier in the month. Deliveries are expected in mid-February. You may remember that Tesla told the world that we would see production start on the all-electric tractor trailer this year, in 2019, but that got walked back to some degree. Investor Worm Capitol visited the Gigafactory 1 in September, as Electrek published at the time, and reported back that “they will begin to earnestly produce Semis by 2020.” What exactly that entails could certainly be more clear, but hey, we did see a Semi prototype running around in red. Pretty snazzy. It should not be forgotten that this revising of strategy came out after another analyst reckoned Tesla would need $10 billion to get all of its plans underway. Also, the Semi got Tesla into a lawsuit with other electric semi company Nikola. Musk just stated this on an earnings call and it was a bit of a surprise, as I had forgotten that this was a thing Tesla still had in mind. Musk said it’ll be like nothing else, but in terms of “very difficult things for Tesla to pull off” that would be rather par for the course for 2019. I’ve seen a few reports that claim Tesla has wanted to get the Roadster into production after the Y, sometime in 2020, but haven’t found anything direct from Tesla to back that up, certainly not recently. The idea of the Tesla Roadster surprises me as it should be genuinely one of the easiest things for Tesla to pull off. As the Model 3 has shown the world, mass-production of high-quality cars at an affordable price is hard. Making a low-volume niche enthusiast vehicle, by contrast, is relatively easy. Getting a tiny EV sports car to produce wild power and acceleration stats isn’t even unique to Tesla anymore. Rimac has been making something like this for years. And yet, Musk is still tweeting about rocket boosters on this thing. Why make anything easy?